Is that a ramp under your foot or are you just glad to see me? If you think that material looks like styrofoam, you’re not alone. It definitely doesn’t FEEL like it though. 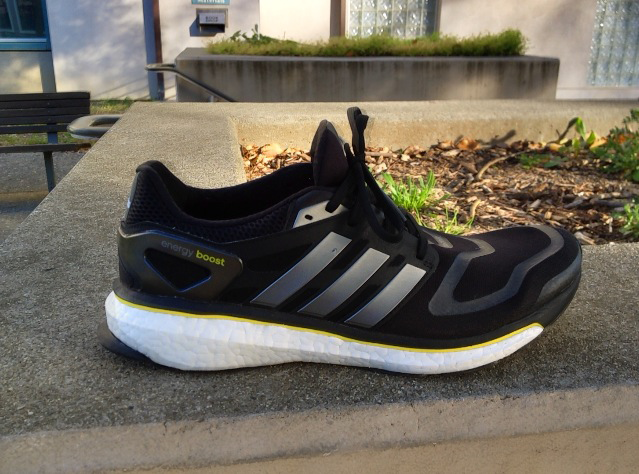 Last week I received an email from one of my local running shops about a chance to preview a shoe from Adidas featuring an “amazing new technology”. Generally I tend to ignore this stuff, the only technology I’m interested from my shoes is usually the ability to not tear my skin apart while being light weight and mostly staying out of my way. However, Peter Larson over at Runblogger had an interesting article on his issues with the marketing related to the “Boost” technology. It intrigued me enough to take a look. In short, Adidas is claiming that their midsole has extremely high “energy return”. What does that mean? Well, they’d love for you to think it means you can bounce around like a bunny in them, but in reality the thought is that you can manage to get a little bit more of a propulsive thrust from them if your form is correct for their type of running. Here’s the issue: joints. In general, when you run you put a whole lot of stress, strain and force into your joints. Ideally, you run with a form that allows you to softly, gently absorb the shifting of your weight as you churn forward. All that, however, goes to hell if you are wearing the equivalent of coked up kangaroos on your feet. So I arrived at Fleet Feet Davis (thanks for hosting and for putting up with my stream of consciousness blabbering you guys!) at 7:15am with a lot of questions and, to be honest, pretty low expectations. The last time I ran more than a mile in this style of shoe I ended up hurt and sad. Still life is nothing without danger and challenge, so target that explosion and fire! I met the rep and immediately liked him. We started chatting about what I usually run in and he admitted he was a forefoot striker himself and actually really enjoyed the new material. What else was he going to say, right? In any case, he tossed me a pair of size tens to try on. “How far can I run in them”, I asked. “I’m here till close”, he answered with a smile. The shoes were very comfortable, a flexible upper made out of a breathable neoprene-type material, though thinner, strengthened with what looked like a bonded pvc or rubber laid across in a supportive pattern. The lacing area was comfortable, with a very light, soft tongue. The heel was high (usually not something I like, but this one was ok) but soft, without the hard heel counter of something like my Altras. The forefoot area was narrower than I’m used to, but because the material is so flexible, I was able to get a fairly decent toe splay. If they make a low-drop version I’d love for them to give the front end just a bit more of a blunt shape to give the piggies room. I stood up and immediately went WHOA. The shoes had a fairly high stack height, and a monster drop of 11mm. Yipes. However when I took a few steps I couldn’t help but smile. They WERE kinda bouncy. The rep saw me smile and chuckled to himself, continuing to set up his display. I put a few things away in my car and took off onto the Davis Arboretum. Thermoplastic Torsion bar = ouchies. Nice traction on the strike pods. I took off at a lopping gait, getting used to the feel of being in a pair of high heels. I immediately fell into a heel-strike pattern of running and my knee complained. It was startling how quickly the pain came on, but I instantly shifted to running midfoot and the ache abated. With an 11mm drop it was difficult to strike forefoot, and a “torsion bar” under the midsole tended to twist my foot when I fell into my standard strike pattern, so I adjusted a bit to the shoe and opened up. A mile in I found myself smiling. The shoe was quite comfortable and I was, for the most part, enjoying the springy nature. Had the shoe been 1/2 the stack height and 0 to 4mm drop I probably would have put in an order, the upper was being very nice to my feet. The bottom of the shoe also provided fantastic protection from irregularities in the road. While this shoe was definitely designed as a road-specific vehicle, I took the sucker over rocks, roots and very nasty off-camber situations and it felt great. A slight alteration of the tread pattern and you’d have yourself a fairly nice trail shoe Adidas! (You’re welcome, feel free to call it The Adidas Fat Panther, I’ll take a 1% cut off every sale lol). 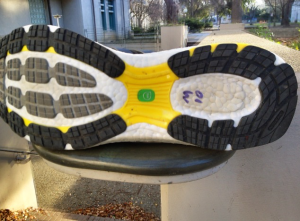 The other very odd thing about the shoe’s design was a “rudder” or “spoiler” sticking out the back of the heel. I’m sure that some designer somewhere thought this was a good idea (and Altra had something similar on one of their trail shoes, so Adidas isn’t alone) but for me it made downhills painful as I had a lot of trouble not catching the damn thing as I descended. Perhaps they expect people to heel roll down hills, though how a knee is supposed to survive that is beyond me. That being said, some quick exacto work would rid yourself of this oddity in no time flat. Seeing as I don’t plan on the heel getting much action, removing rubber there would be no tragedy. Overall I was very pleased with this new shoe from Adidas, and I came into the test ride thinking something quite the opposite. The “bounce” you get from the boost material, when combined with a soft, mid-foot strike pattern, gives a lovely solid feel underfoot. (Note: a very fit woman who was also testing the shoe noted that she felt the forefoot was under-cushioned though she liked the bouncy heel, which was exactly the opposite of my opinion. Her standard running shoes were a pair of Nike Free minimalist shoes. So your mileage may very. Pun definitely intended.) The uppers were fantastic, very comfortable right out of the box. I ran over 4 miles on them the first time out and didn’t have a single hot spot, blister point or discomfort. I’d lounge around in the house in these, seriously. If you’re a heel striker you’re going to seriously have a crush on this shoe. While I hate to fall headlong into cliche, it is a game-changer. Not because it is going to “reduce oxygen consumption by 1%” or whatever nonsense Adidas is touting. No, it changes the game because it is a shoe that somehow manages to cushion well while not feeling like you’re running on sand or a mattress. 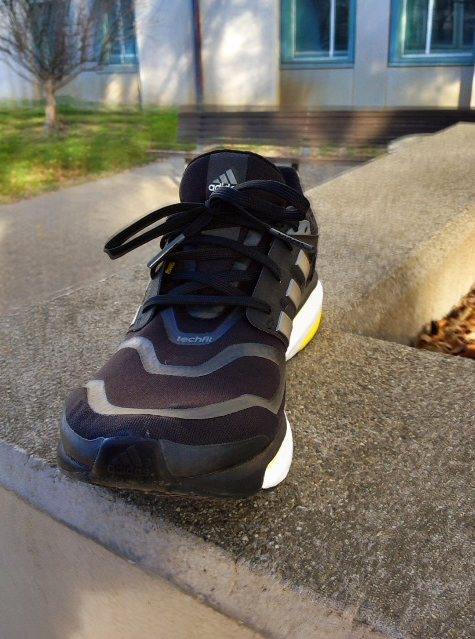 I will go on record here as saying if Adidas takes this material and drops it into a 6mm stack, 4mm drop shoe with the same comfortable upper, it is going to KILL in the stores. In the current traditional format, I think people are still going to very much enjoy this shoe. Not because of the marketing or the neat displays or the name, but because when you try them on and jog around, they’re going to feel pretty damn swell on your feet (as long as you’re a neutral heel/mid striker, that is). High: Comfortable, bouncy traditional high-drop running shoe. Upper is super nice. Low: Torsion bar can cause twisting for pronators, weird rudder, egad that price! This entry was posted in Gear Review and tagged Adidas, Boost, drop, running, shoe by TheFatPanther. Bookmark the permalink. Having done a lot of running in it for the past week I really like it, partly because it’s fast but mainly it takes away some of the crunch from pounding the pavement and street. It felt like effortless running at times, maybe that’s the smile factor. I wonder if the heel was much lower whether the selling point ‘energy return’ would be as effective, maybe they wanted to maximise the bouncy aspect for the launch shoe. I’d like to see if a low heel version would be a noticeable improvement on what’s currently on offer, and also how long the material keeps it spring for. On my third run it seemed to have less of it but maybe my legs were tired, time will tell. But as a general mass market running shoe it’s great fun, comfortable, too expensive but if it gives me a couple of minutes on an upcoming marathon it’ll be worth it. Read all the reviews and plunged head first and invested in a pair. Tried to break them inn gradually with two short runs but found my calves very tight. Reverted to my Asics 33 lights and no tightness, tried the Boosts on 15k morning run, 8k inn and right calve muscle ceased up, that was 8 weeks ago and only now recovering fully. interested if any one else has had any similar problems? They seem like a quality shoe was I just unlucky? Kem, one item I found was that the plastic piece under the shoe had a “skewing” effect on my right ankle. My right ankle doesn’t track straight and when the shoe went through its strike motion and loaded, it would attempt to “right” itself. I’m wondering if your form is similar and it is causing you to twist slightly. On me it caused some knee and hip issues, though if I focused on my stride I could mitigate them to a degree. I would really love to see Adidas decouple that plate, cut it into pieces so that an uneven loading of the shoe does not turn into something that causes the issues you and I seem to have. ok, so I’m coming into this discussion rather late, sorry. i’ve had my Boost now for 4 months and in that time i’ve had more injuries and soreness than I’ve had in years — I’ve put approximately 250 miles on these shoes and run a couple half marathons. The big thing bugging me now is lower back pain. I’ve NEVER had back pain, certainly not after running. And now I need a hot shower and stretch touching my toes for a long time to alleviate the soreness after my regular runs. I’ve searched and found lots of posts about weird achilles/calf pain, but can’t find anything on others getting back pain. Is it the shoes or am I just getting old??? I’m no doctor, and as a coach I can’t speak to running (gymnastics/inline here) but what you’re describing does sound like it is a combination potentially of form issues + just getting older. I’m not talking about heel striking vs midfoot/forefoot here, but of potentially an overstride issue. If you contact the ground way ahead of yourself you’re generating some serious braking forces. I’m not sure it would be the shoe, but even if the shoe is _now_ causing this, it is probably something that’s been building up. I would recommend rest, and getting some barefoot runs in at a nice, soft grassy area. My buddy James over at http://www.kinetic-revolution.com/ has some great tips about gait, stride & form. Check him out & let me know how it goes. I have the same issue. I love the plushness of the cushion and feel of it. But I also have the after affect of some lower back pain and stiffness. I think it might be from old injuries. I played rugby when I was a teenager and in college, so I think that explains it for me. I had my ladies boost in December. On the 3 occasions I have wore them I have twisted my ankle each time. The last time, just 3 days ago, was disastrous when I fractured my ankle so now I’m out of action for months. I tell everyone to keep away from them. “Sock fit” is supposed to mean that you can wear them without socks, though I have yet to find a shoe I can just shove my dogs into and run 20 miles in without serious consequences. I think the important thing is to run mindfully, make sure you’re not getting hot spots, and pay attention to the fit as it wears in. Personally I like a lot of slop inside my shoes, just a natural consequence of running in sandals off and on, so having my feet feel like they’re wrapped up would just not feel good to me. Your mileage may vary of course. Keep in mind too that even if the shoe doesn’t cause issues, having your toes bound up could create blisters between the toes as well. Finally, it is important to note that running on a treadmill is going to be different than being “out in the wild”. Mills don’t really provide quite the same differentiation as out in the world. Sidewalks, trails, etc will always be a little off camber, have bits of gravel, change temperature, all that. So a shoe that feels great indoors may not do so when you head outside. Just gotta give it a shot though, never know till you try. I purchased the ultra booster…doesn’t work for me…gives me soooo much pain in my calves & archilles. Never got this pain with any other running shoes styles and brands.